Milady Standard Esthetics Fundamentals, 11th edition, is the essential source for basic esthetics training. This new edition builds upon Milady’s strong tradition of providing students and instructors with the best beauty and wellness education tools for their future. The rapidly expanding field of esthetics has taken a dramatic leap forward in the past decade, and this up-to-date text plays a critical role in creating a strong foundation for the esthetics student. Focusing on introductory topics, including history and opportunities in skin care, anatomy and physiology, and infection control and disorders, it lays the groundwork for the future professional to build their knowledge. The reader can then explore the practical skills of a skin care professional, introducing them to the treatment environment, basic facial treatments, hair removal, and the technology likely to be performed in the salon or spa setting. 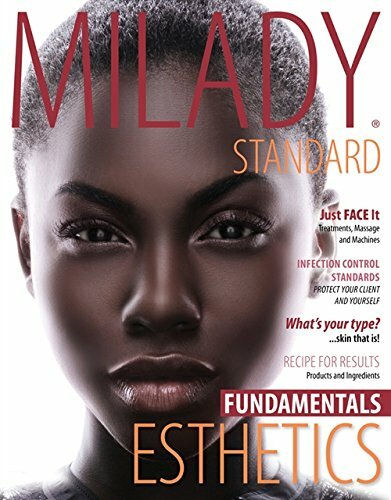 Purchase Milady Standard Esthetics: Fundamentals at Discounted Prices ✓ FREE DELIVERY possible on eligible purchases. Like New, Excellent Condition, Hardly Used MILADY ESTHETICS BOOK.